Now before we start, I'll spare you the usual disclaimer about the real struggle that is writing perfume reviews. Scent is so subjective. You like it, it stays on your skin and adapts over the day or you hate it entirely. Byredo's fragrances are unique. Biblioteque has the woodsy aroma of a bookstore and the freshness of paper stock. Gypsy Water, a woodsy, amber and sandalwood delight. 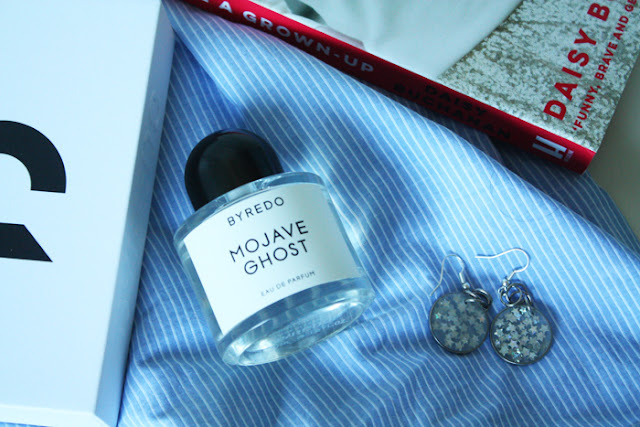 Mojave Ghost is what I personally describe as the sophisticated, grown up, long lost sibling of Daisy by Marc Jacobs. It's inspired by the Mojave Desert flower, Mojave Ghost, hence the name. The scent itself contains notes of ambrette, Jamaican nesberry, violet, sandalwood, magnolia base, chantilly musk, crisp amber and cedarwood. It's floral and a bit musky+woody. I seem to be automatically attracted to scents that have sandalwood and florals in their fragrance fabric so if you're similar, you'll probably like this one. What I do think this Byredo scent has on a lot of other perfumes is that it genuinely does stay on the wearer all day. You could probably get away with one spritz at a time, I usually go for two and I can always still catch its notes on me at the end of the day. Its one of those fragrances where you get to experience the different notes as the day goes on, which I love. I've even picked the scent up on my cat from when I've held her as well as on my scarves and things. It certainly doesn't fade! So my first foray into admittedly indulgent fragrance territory was a good 'un. Mojave Ghost may be a 'treat yo'self' kind of buy but given how little of this perfume you need at a time, it'll last a fair while. To prolong the life of your perfume, store it in a dark place away from sunlight/somewhere where the sun isn't going to hit it. You can also find Mojave Ghost in rollerball and hand cream form if you want to give it a try first. I'd probably go to heaven if it became a candle. Hint hint, Byredo. -Have you tried any Byredo fragrances before? What did you think of them?